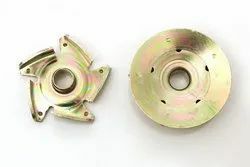 To match up the varying demands of the clients, we are engaged in offering extensive array of Sheet Metal Stamping Parts. Our provided Sheet Metal Stamping Parts is rigorously tested by the team of quality controllers to ensure its reliable performance. Our prestigious clients can avail our entire products range from us at market leading prices. The Sheet Metal Stamping Parts we offer is manufactured using quality grade materials, cutting-edge technology and advanced machinery under proper guidance. Looking for Sheet Metal Stamping Parts ?